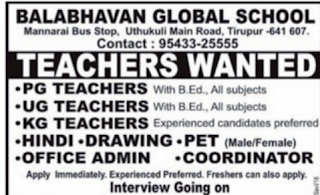 Balabhavan Global School, Tirupur has advertised in Dinamalar newspaper for recruitment of PGT/ TGT/KG Teachers/Non Teaching Faculty jobs vacancies. Interested and eligible job aspirants are requested to apply within immediately. Check out further more details below. 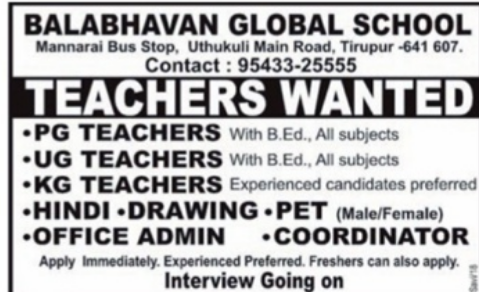 Name of the School: Balabhavan Global School, Tirupur. About School: Balabhavan Global School’s location is at Mannarai, Tiruppur. There are 20 dedicated and professional faculty members who impart quality education to children in this State Board school. Balabhavan Global School was launched in 2009. With the student teacher ratio being 9:1 the primary medium of instruction is English. The school takes pride of its excellent teaching methodology. (c) KG Teachers Experienced candidates preferred. (d) Freshers also can apply.